Everyone who has installed a dryer has the same problem - the size of the dryer vent requires you to push the dryer 6-8 inches away from the wall. If you want to have a countertop over your machines, this means that you'll have to have an extra deep countertop. Our solution: pull the venting through behind the laundry room wall and into the adjacent storage room. This solution only worked because we had access to the "backside" of the laundry machine wall. If your laundry machine is on an exterior wall, you won't be able to do this. We actually did the same thing with the plumbing: we moved the hot and cold shut off valves for the washing machine into the adjacent room. By avoiding pushing out the machines we were able to (a) save six inches of floor space, (b) avoid additional countertop cost, and (c) hide the plumbing lines (we avoided having the shut off valves visible above the counter). Reno tip: When planning your laundry room, consider where your venting and plumbing/valves will go. Is there an opportunity to run them into a service space or another room, or perhaps into a nearby sink cabinet? Can you configure them somehow to save some space? 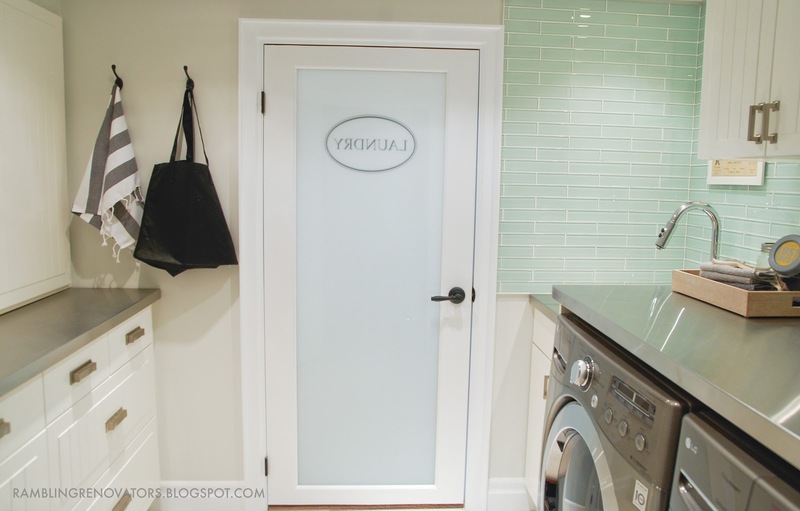 Laundry rooms are typically below ground and have little natural light. We thought we could bring in more light by having a frosted door and bounce it around the room with the glass tile and mirror. We originally planned for two pot lights - but once the framing was up, we realized this would be not enough. With lighting especially, its important to reassess your lighting plan once the framing is up and you see the actual spacing of the lighting (based on location of the joists). Its much easier to have ample light (and put it on a dimmer to lessen it) than try to add another light after everything is done. In our electrical plan, we outlined the location of every plug and light switch. We determined location by looking at how we would use the room: where would we be ironing, where would the TV be located etc. However, we forgot about the in-floor heating thermostat and left it to the electrician to install. He placed it at shoulder height... right in the middle of the one wall we were planning to put some artwork. We actually made the same error in our upstairs bathroom, where the thermostat falls right below our towel hooks. Reno tip: Receptacles can be easily re-located pre-drywall so make sure that receptacles "work around" your other items (artwork, windows and doors, cabinets, countertops etc.) and are easily accessible. Ensure your electrician knows what items are coming in down the road so that he can place receptacles appropriately. This next tip manifests itself in various scenarios but the basic concept is this: ensure that you place things so they have the physical room to function. For example, if you want to place cabinets on the counter like we did, you need to have 'spacer' panels below the cabinet and beside the cabinet so that the cabinet door won't scrape the countertop and so the doors can open fully beyond 90 degrees. Other examples: ensure your faucet is placed far enough from any wall so that the handle can fully rotate back and forth if it needs to, ensure that laundry machine doors have room to swing open. 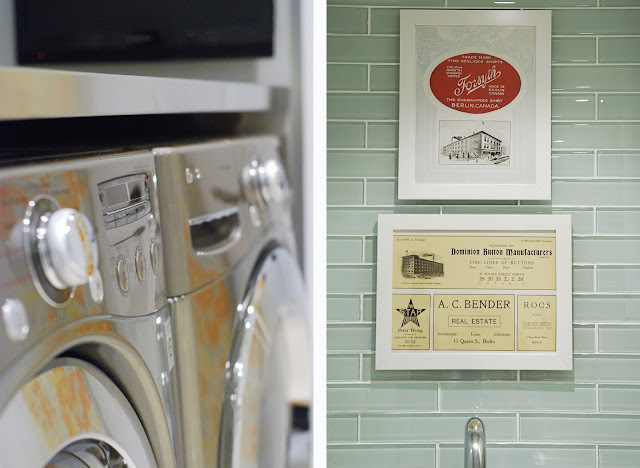 Our laundry room might look "blinged out" but the few creature comforts we added in actually didn't cost that much. The in-floor heating? There's a small investment in the unit (cost depends on the size of your room), but it only costs approximate $0.05/day to run. The TV? The TV was on sale and to add the additional plug and cable outlet to our existing electrical quote was only $75 more. But here's the thing: these small add-on's actually increased our enjoyment of the laundry room significantly. Now we're more willing to do the laundry and more apt to stay in the laundry room for a longer time. These are two investments that have huge returns. If you are building a new laundry room, you might think to plan the laundry room size just based on the essentials (room for washer, dryer, and maybe a sink), but if you are planning for any storage, use that to plan your room dimensions. I knew I wanted to maximize storage with at least two banks of pot drawers on one side of the laundry room and the washer, dryer, and sink cabinet on the other. Since we were using Ikea cabinets, I used the Ikea kitchen planner tool to mix and match options. Once I came up with a final design (two 30" pot drawers and one 18" drawer stack), we knew the minimum dimensions of the room. The result is the cabinetry looks custom fit to the room. If we had just laid out the room and left the storage planning until later, we might have had some weird dimensions that standard Ikea cabinetry couldn't fit and we'd have to find a 'hack' solution for, or have some extra large filler panels. Our washer and dryer were purchased new and perfect, but another way to get some significant savings is to check out the "scratch and dent" area of your local appliance retailer. Some of the imperfections might be on the side or top of the machines and if you will be enclosing them or placing a countertop over them anyway, it might not matter to you! Laundry rooms don't need to be laundry rooms at all times. Can your laundry room also be your gardening room? Laundry + mudroom? Or laundry + craft room? Think about all your needs and see if there is a way to build multiple functions into one room. Our list of needs included: a sink for craft cleanup, storage for pantry items, general household storage, a hanging rod. We also considered putting a small fridge in the laundry room, to create a laundry + basement beverage center. Reno tip: Identify your list of needs before you plan your layout. See if there is a room design that can satisfy more than one of those needs. Overall, a laundry room isn't a difficult room to renovate, but when done right, it can be one of the hardest working, most enjoyable spaces of your home! I just love your laundry room makeover. Your tips are inspiring! I would DIE for this laundry room (and the ability to have something more than the SMALLEST washing machine in my basement). Maybe in the next house we can have space for a gorgeous, just for laundry space. A great option for dealing with the dryer vent is the DryerBox, which lets you push the dryer all the way back against the wall. Such good suggestions. I"m dying to know though, what happened about the floor heating thermostat? Did you have it moved or have to work around it? the first tip is super smart! deep counters work in this house (not that we had a choice), but yout bet i will keep this in mind if we ever move!!!! can i ask who installed the mirror? do you have a mirror guy! i want mirrors on my master bedroom doors sooooo bad! The tip about moving the shutoff and venting to another room is huge! I'm stuck with an exterior wall, but still it's a great tip. Do you have photos of the cutoffs / venting? I know, right? I'll show it in an upcoming post about the storage room. I dont have a laundry room...yet, but these are especially helpful tips, especially if we can get and AMAZING laundry room like the one you and your husband labored over. So many great tips!! We are adding a laundry room onto our home and I'm so excited about doing laundry inside vs. in the garage! Great tips! I especially like the 'double duty' idea. 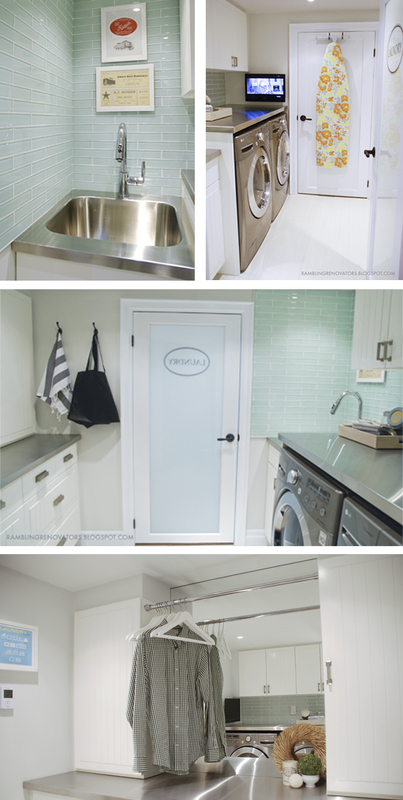 If you have a big enough laundry room space, this makes so much sense! SO gorgeous! Great tips, which I'll be filing away for when we tackle our unfinished basement. I LOVE your Laundry room, and I think I actually wouldn't mind doing the chore if I had a space like your to do it in! Thanks for the tips - I'm sure they'll be more than helpful to many of us.